Knowing my interest in Avengers strips, a friend has pointed me at a Yahoo Group with oodles of information on the contemporary strips of the 60's and 70's. And there's also the Winged Avenger site too. Cheers. I've put my request to join in. I joined a while ago. I thought it was your group, Jasper. Nope. Never heard of it until today. You may understand why I thought that when you read one of the posts! All has been made clear. Get in there and enjoy the strips. I love the byline: "Stripping with Mrs. Peel." Somebody's going to be so disappointed when they join. I also found this small site before I noticed your link. It is interesting to see what the comic writers invented for Avengers stories, and whether the illustrators' got close to the characters (or not!). From DC comic 'Blackhawk' issue 223. 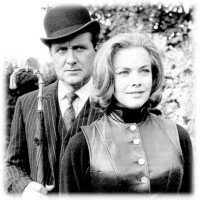 This issue also is seen to be read by Mrs Peel in the episode. The 'Winged Avenger' comic - which is a specially drawn cover glued onto an existing comic - does not though correspond with the back page of #223. The advert with the red car appeared on issues #216 and #217 of Blackhawk. However this advert probably appeared on most DC comics in the same two months so it could have been any number of comics. In the episode Steed also views another 'doctored' piece of artwork.. However with no clues to go on this one will probably remain a mystery for now unless some DC fan stumbles across it. If it were possible to read the text in the speech ballons in a blow up from the original film print, then that could maybe help? More information on this on The Forget Me Notes site along with Avengers strip notes and information on the Lion comic seen in the episode 'A Sense Of History'. Those who found out about the real comics are 'Masters'. New at 'The Forget Me Notes' is an overview of the Steed inspired superhero comic character 'Big Ben'. Originally appearing in Dez Skinn's 'Warrior' magazine in January 1983. I'm not familiar with this character. This must have been after I stopped reading comics and discoverd girls. "The Man With No Time For Crime". I like it. "You'll believe a Steed can fly..."
This is fascinating. Mostly how they managed to get away with such a blatant rip-off--they even had the gall to stick a shot of Steed right there on the cover with their new hero. In a decade where they got after Geoff Barlow for writing about "Steade" and "Peale", it's a wonder they weren't sued. Now at the Forget-Me-Notes site is a look at the rarest of the Dutch Avengers comics. TV Stripalbum #1 - De Wrekers. This one has almost the same cover as the 1969 Avengers Annual, but with Tara made to look like Emma. Looks nothing like Emma - looks totally like Cathy Gale.